We went visiting Dr. A again on Tuesday. 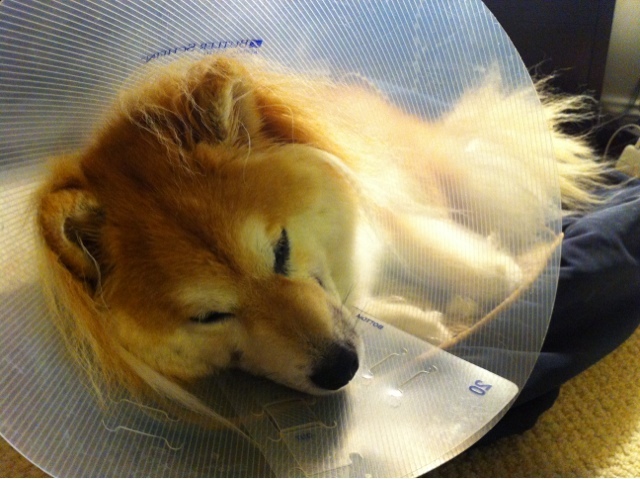 He was surprised that Maya's conditions worsened and showed up in an e-collar. Maya got super excited as soon as he stepped into the room, and just like flipping a switch, she started to itch like crazy, rubbing her face against our legs and on the cone. Her skin around the areas with missing fur kind of flared up as well. It's kind of "nice" to let the doctor see first hand how she's been reacting. I went through the ups and downs in the past few weeks, showed him the hot spots on Maya's feet, and gave him an update on her diet/supplement changes. I told him I was trying out a some new Chinese Medicine, and before I pulled out the bottle of Xiao Feng San, he told me he was going to suggest some "wind eliminating formula", so I guess I was on the right track. Dr. A still believes that Maya's conditions are caused by blood deficiency, especially after seeing her being so itchy when she's excited. (I think it's kind of like how my thighs itch after exercising, due to bad blood circulation.) He thinks that Maya could be extra sensitive to itchiness, so that given the same conditions as other dogs, it's more severe to her. He also had this theory that smarter dogs tends to hurt themselves more, as they are better at "solving problems" on their own. He explained to me that Maya's non-stop scratching could be some sort of anxiety, and a mild sedative drug may help "take the edge off". Valerian root, Alprazolam, and Diazepam are the ones he suggested. Since valerian root is a natural herb while the others are actual drugs, we decided to start with that first. It is often used to help with sleep and anxiety issues. As for Maya's diet, he suggested a few changes: increasing raw liver to about 1/4 of her diet, and adding some avocado to her meals. Both ingredients should help "tonify" her blood. I asked the doctor about a few supplements I read online, specifically Quercetin and Colostrum. He agreed that those could be beneficial, and wanted me to try them out. If nothings improves in the next few weeks, he would like us to try acupuncture and vitamin B12 injections on our next visit. Because of his suggestion, I asked whether supplementing vitamin B12 will help, and it got added to the plan as well. He also showed me the acupuncture points, so I can try massaging her at home. An hour (though I was only charged for 30 minutes) and $90 later, I walked out with another long list of things to try and a mixed feeling towards the visit. The anxiety theory is definitely new, but other suggestions were more like my idea than his. Well, at least they didn't try to sell me anything this time. I guess he realized if I was able to purchase those Chinese medicine on my own, there's nothing I couldn't find. I don't want to start all the new stuff at once, so I'll probably introduce them one by one in the next 2 to 3 weeks. I'll start with the valerian root first, as it has more potential to have some immediate effects. Fingers crossed. Poor Maya hope you get better soon. Saya has had avacodo before she liked it. I only gave her the green meat of it made sure no skin in it.. She only gets it as small treats when I get it which isn't often. I didn't know it'd be good for the dog like that.. Some people say that avocado is bad for dogs, so I was a bit surprised as well. The doctor wants me to feed 1/4 per day, which seems to be a bit much, since it has high calories. I haven't started yet, but I will start with a small amount just to be safe.